The Zhou ruling dynasty was founded by King Wen, and solidified by his successor King Wu, who conquered the Shang Dynasty. During this period, the Zhou were based along the Wei River in Shaanxi Province and ruled much of the Wei and Yellow River valleys as well as portions of the Yangzi and Han river systems. The rulers were kin-based, and the society was strictly tiered with a strong aristocracy in place. About 771 BC, the Zhou leaders were forced eastward out of their previous strongholds near Mount Qi and into a reduced area near their capital city of Luoyang. This period is also called Springs and Autumns (Chunqin), after a history of that name which documented the Eastern Zhou dynasties. The Eastern Zhou rulers were despotic, with a centralized administration and a ranked bureaucracy. Taxation and corvee labor were present. About 481 BC, the Zhou dynasty fragmented into separate kingdoms, the Wei, Han and Zhao kingdoms. During this period, iron working became available, the standard of living rose and the population grew. Currency was established enabling far-flung trading systems. The Warring States period ended when the Qin dynasty reunited China in 221 BC. Historical documents dated to the Zhou include the Guo yu (the oldest known history of China, dated to the 5th century BC), the Zuo Zhuan, the Shangshu and the Shi Jing (poetry and hymns). Capital cities of the Zhou which have been identified archaeologically are relatively rare, but probably include Wangcheng (in present-day Xiaotun), Doumenzhen, Luoyang, Hao-Ching and Zhangjiapo, where some 15,000 tombs were identified and 1000 excavated during the 1980s. 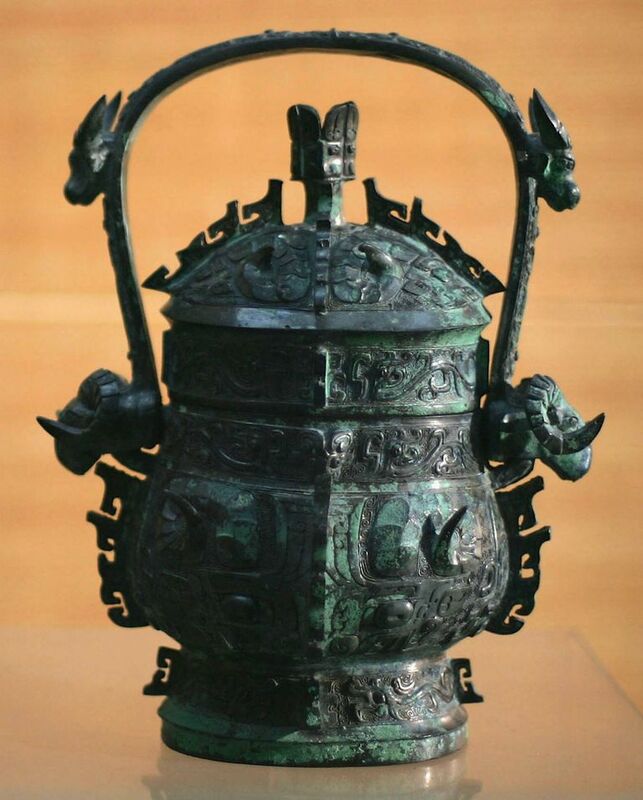 Bronze vessel hoards, deposited when the Zhou fled the west, have been identified in Qishan county of Shaanxi province, such as at several sites in the modern town of Baoji. These beautiful vessels (the two 'you' illustrated here are from Baoji) often have inscriptions which contain genealogical data, which allowed researchers to reconstruct lineage data for the various Zhou royal families. Falkenhausen, Lothar von. 2007. Chinese Society in the Age of Confucius (1000-250 BC). Cotsen Institute of Archaeology, Los Angeles. Shaughnessy, Edward L. 2004. Western Zhou Hoards and Family Histories in the Zhouyuan. pp 255-267 in Volume 1, Chinese Archaeology in the Twentieth Century: New Perspectives on China's Past. Xiaoneng Yang, ed. Yale University Press, New Haven. Taketsugu, Iijima. 2004. An investigation of the Western Zhou capital at Luoyang. pp. 247-253 in Volume 1, in Volume 1, Chinese Archaeology in the Twentieth Century: New Perspectives on China's Past. Xiaoneng Yang, ed. Yale University Press, New Haven. Which Dynasty Lasted the Longest in Ancient China? What and Where is the Ancient Capital of Erlitou?